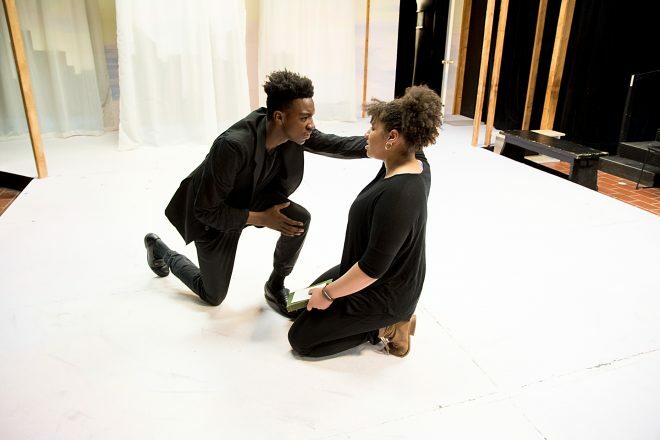 The audition for students applying to the Theatre Department’s Actor Training Program consists of the presentation of a memorized and prepared monologue(speech) by each student. In addition, some students may be asked to return to participate in an improvisational group workshop. This workshop allows the audition judges to take a second look at applicants about whom they do not have a definite judgment based on the monologue. APPLICANTS WHO ARE NOT ASKED TO DO THE WORKSHOP SHOULD NOT ASSUME THAT THEY HAVE NOT BEEN ACCEPTED. The monologue should be a speech, one to two minutes in length, by an individual character in a play. A speech of required length may be developed by cutting out lines spoken by another character or characters, if the sense of the speech can be preserved. Fully memorize the speech. Imagine yourself in the place where the speech is set in the play. Imagine the other character or characters to whom the speech is given. Imagine yourself thinking the thoughts and feeling the feelings of the character. If possible, the student should read the entire play from which the monologue is taken to aid in comprehension, and the monologue should be fully memorized and rehearsed(a copy should be brought to the audition in case you need to refer to it). The panel of judges may wish to see some students’ work in a different context, in which case those students may be asked to return to participate in a workshop. The workshop lasts approximately 45 minutes and is conducted by members of the Theatre Department faculty. The students are asked to improvise (pretend) a variety of situations and events in immediate response to the teacher’s direction. Loose-fitting clothes appropriate for physical exercise should be worn. Concentration – Does the student stay focused on the task presented in the imaginary situation? Physical response – How freely and specifically does the student use his or her body to respond to the circumstances of the imaginary situation? Vocal quality – How easily and expressively does the student use his or her voice? Emotional connection – How fully can the student connect to the thoughts and feelings of the character? Imagination – How completely can the student enter the imaginary world of play? DO: Prepare a 1 to 2 minute monologue from a play. Prepare: Fully memorize the speech. Imagine yourself in the place where the speech is set in the play. Imagine the other character or characters to whom the speech is given. Imagine yourself in the emotional and psychological circumstances of the character you are portraying. Monologue: A speech from a published play, spoken by one character. A monologue of appropriate length may be created by cutting out lines spoken by other characters and “piecing together” a speech. (If you choose to do this, be sure the monologue makes sense, both logically and emotionally). DON’T present a monologue that you wrote yourself. DON’T bring props or set pieces for your audition (f you must have something – very simple, such as a piece of paper to use as a letter, that is permissible). Chairs, stools, and a table are available in the audition room. DON’T wear a costume for your audition. DON’T deliver your monologue to the panel of judges as if they were characters in the scene with you. NOTES: Speak to another imagined character on stage with you. Place this imaginary person downstage (in front of you as you face the audience). The following list of plays and characters offers possible sources for appropriate monologues. You are free to use a monologue from a different source. If you choose a monologue from another play, choose a character that is close in age to you. Following are complete texts of monologues that may also be used for the Actor Training Program auditions. adapted from….AND STUFF by Peter Dee. Bill, a young student, tells his friend about his feelings of loss when his favorite teacher leaves his school. BILLY: Everyone tried to tell me Mr. McKenzie left because of the low pay and because he got a better job with IBM, but that’s not true. Mr. McKenzie wasn’t interested in that material stuff. He was interested in us. He cared. He made us work hard. Be serious about what we were doing. He was a real teacher. I used to dream he’d marry my mother and be my father. ‘Cause he was like what a father should be. I never missed having a father till Mr. McKenzie came along… then I thought in some kind of crazy way that I finally had one. I never told anyone that till now. The day that George Blake tore Mr. McKenzie apart in class was the day Mr. McKenzie quit. I mean he stayed till the end of the year, but his spirit died that day. I could see the change in his eyes and the way he held himself. I tried to say things to make him feel good about himself again, but he wasn’t listening anymore. George Blake spray-painted Mr. McKenzie’s sport coat yellow. When Mr. McKenzie grabbed him, George just laughed in his face. Said it was time for him to get a new sport coat, that he looked like a bum and that it was hard to be taught by the dullest man in the world but did he have to look like a bum as well. He said father made more in a month than Mr. McKenzie made in a year and he’d get his father to replace the sport coat he’d ruined with something that had some class. Mr. McKenzie cold have reported him, but he didn’t. that wasn’t his way…. He just died inside. And then at the end of the year he left. Adapted from CANDID by Michael Scanlon. T. J. talks to a friend about another friend of his — Rick. T.J.: One time when we were little squirts, Rick dared me to jump off the high dive at the pool. So, I climb the ladder — my knees are knocking together, my lunch is rushing toward the nearest exit — and I step onto the board, which I swear is a least six thousand feet above the surface of the pool. I look down and I know that there is no way I’m gonna jump. Even at the age of nine I understand that humiliation is preferable to death. So I back down the ladder to the calls and laughter of the kids who assembled to see me commit suicide. As I get to the bottom, rich walks over to me, shakes my hand and says, “That was great. Anyone can jump off a diving board, but you have to be really brave to climb down a ladder backwards.” All the kids act very impressed with me, start patting me on the back, telling me how brave I am. I even start believing it myself. I even start bragging about it. “Boy, I can’t believe I actually had the nerve to climb down that ladder backwards,” I say. Rick, totally disgusted with me, says “You jerk, Did you ever hear of anyone coming down a ladder forwards?” I felt really, really dumb. But Rick’s not a bad guy. Really. Adapted from MAKIN’IT by Cynthia Mercati. Larry talks to a school counselor. The counselor has just said to Larry that he seems a little “different” from the other students. LARRY: Different. There’s that word again. “You’re so different from the other kids,” the teachers always say. “You really care about Henry the eight and how many wives he had — or why Russia invaded Afghanistan.” And then everyone stares at me. Even my father says it. “You’re such a different kind of kid. When I was your age, I was always with my friends or shooting baskets or just goofing off. You’re always in your room reading.” One day a guy in class asked me what kind of music I liked. Without thinking, I said, “Classical.” He laughed so hard he turned red. Right then I decided I’d never — ever — let anyone know what I was really, reallythinking or wanting — or feeling. I could fit in if I pretended more, played the game. But I can’t seem to figure out how — or maybe it’s just that I won’t. My father says that I’m stubborn. “It’s amazing. A quiet, shy kid like you, so stubborn.” I guess that’s something to be proud about. Only the way he said it, it sounded like I was stubborn about the wrong things. Different. It’s the ugliest work in the English language. I hate different. So I guess I hate me. But someday I’m going to find a city or town or a world where everyoneis different and no one cares. THAT DAY (adapted from Inside/Outby Michael Scanlon). Suzie tells a new friend about her older brother. SUZIE: Michael and me — well, we’re closer than most brothers and sisters. I guess we had to be. We’re what the school psychologist calls — products of a broken home. It was more than broken, it was all smashed to pieces. Mom and Date got a divorce. Not so awful, right? But then Dad remarries. Worse, but not tragic. Then Mom dies unexpectedly. An accident. And Michael and I have to move in with Dad and Patricia. I guess it all hit me pretty hard, but it destroyed Michael. He’d lock himself up in his room for hours at a time. Well, when he finally came out of it, started eating again and talking and stuff, the only one he seemed to care about was me. And I loved Michael more than anybody else in the whole world. When I was still little and played with dolls, if anything would happen to them — you know, like if an arm or leg came off, I’d take it to Michael. He wouldn’t tease me or anything. He’d just look very serious and say something like, “Well, fortunately, I think we can save the limb.” That always used to crack me up, ’cause I was little and I thought only trees had limbs. And Michael would fix my doll, and bandage my scrapes, and hold me when I was sad. And when I’d try not to cry, he’d say, “It’s okay, Suzie, you’re allowed to cry. In fact, you’re supposed to cry because it relieves eyeball tension.” And of course I’d just laugh and laugh. Eyeball tension. From EATING CHICKEN FEET by Kitty Chen. Betty is a teenager whose parents split up five years ago. She talks to a friend. BETTY: One day, five years ago, the end of the world came. I sat on the grass and watched the moving men load the truck. All the furniture was on the lawn, the dining room set, the cherrywood dresser, sofas, mattresses. All her bags and trunks, and boxes and boxes and boxes. Furniture always looks so sad outside of a house. Have you noticed that? it’s funny how you see all the dents and gouges and chipped paint you never saw before. Everything looked so shabby. For a moment I was almost happy to see it go. Then suddenly I had this fear, I knewthat they were going to pull up my house and put it in the truck. It hit me like a twig thwacks back in your face. Everything would be gone. There’d be nothing left but an empty lot full of weeds. “Put it back!” But they’re just standing there…looking at the air and not seeing anything. “Do something! Dom something before it’s too late!” They keep looking in the air. I’m screaming but no one hears me, nobody does anything. STOP IT! STOP IT! If I close my eyes…and wish really hard…everything will be all right. Any minute now Mom’s going to say, “Open your eyes. No one’s leaving, no one’s taking the house. I’ve just been fooling you. This is a joke, a test. Just want to see if you’re a good girl.” When I open them, my house will be back in the ground. The furniture will zip back in like a movie playing backwards. The piano will be in its place under the staircase. The dining room table will be set for dinner…Everything will be the way it’s supposed to be…And I will have a happy family. Adapted from REAL by Jimmy Brunelle. A young girl talks to a teacher. ERICA: Most people think I’m weird because I volunteer down at the local homeless shelter. “Why do you want to hang around those low-lifes?” It’s just that one day, I walking around feeling really sorry for myself because my mother wouldn’t let me pierce my nose – everyone else was getting it done. Anyway, I walked by this vacant lot that was really, really littered. Suddenly, this guy sits up from beneath all these cardboard boxes. I’d never seen anybody so dirty. Beard down to here. Hair down to here. It was his eyes, though. When I looked into them, it was like everything just disappeared…except for this eyes. It was like I was seeing myself – but he wasn’t me – but he was me. I just took off running as fast as I could. I didn’t want to feel what I was feeling. Finally, something made me stop. I couldn’t just do nothing. So I bought him a pepperoni pizza, went back and plopped it down in front of him like he was going to bite me or something. he said, “Thanks, sister,” and smiled. I said, “you’re welcome,” and really meant it. Then I walked home – the long way. I needed to think. Up to that point, my whole life was a lie. For the longest time I pretended to be something I wasn’t – so other people would accept me. I finally saw someone for the first time…me. So, that’s why I work at the shelter. There, I feel real.